I’ve been a bit busy lately with my job search but now I’m pleasantly surprised that there’s a new place for us foodies to see some of the best food on the net. All of you who love to cook should definitely check this page out, and this is how you become featured! I’ve been taking pictures of my recent creations and this is the perfect opportunity to share them. Albeit, I may have to find some place with better lighting considering I live in a dungeon surrounded by evergreens. This is what I’ve been up to! 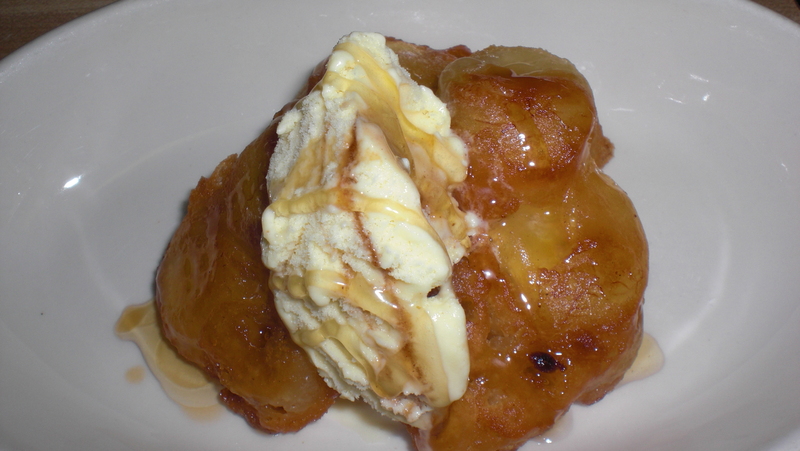 Who doesn’t love fried bananas? The bananas I bought weren’t ripe yet so I decided to batter and fry them up to cut acidity. I splashed some honey and Kahlua on top with some eggnog ice cream. I’ve always enjoyed stir fry but only recently have I been able to find the noodles (without making them myself). 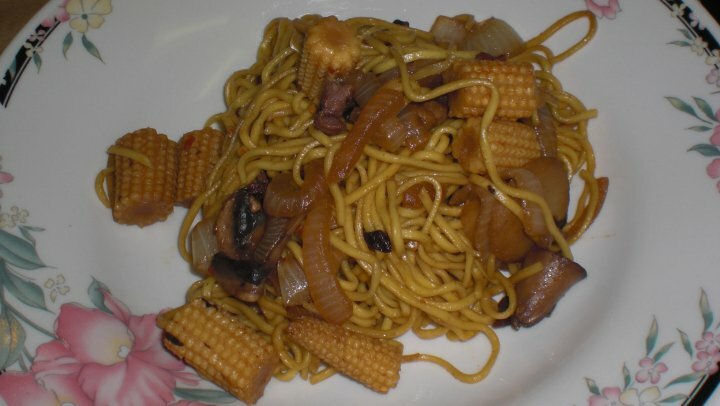 Baby corn, mushrooms, onions, and some fresh ginger made this a delicious vegetarian option. Of course, it wouldn’t hurt to modify this dish for those who love their meat. Any meat would do great in this! I love sweet and sour so I decided to make myself a teriyaki sauce (mirin, sugar and soy sauce) with a touch of orange sauce and green onions. Best served with Japanese rice. I never enjoyed meatballs as a child, then again, I didn’t like beef in general, but after preparing these delicious little morsels I have become a new-found fan. I didn’t bother with a recipe but just mixed a pound of ground beef with an egg, some seasoned bread crumbs, a bit of milk, Parmesan, and whatever seasonings sounded good. The tomato sauce is slow cooked with bell peppers, onions, garlic, basil, thyme and some rosemary. Sometimes I sneak in a bouillon cube instead of adding as much salt. 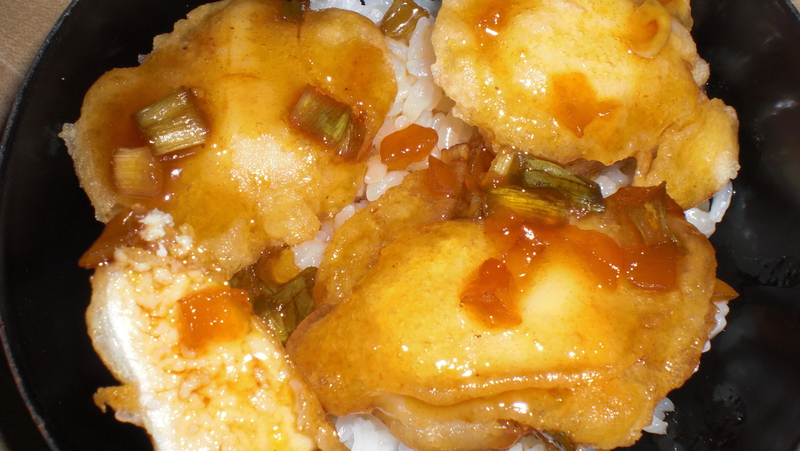 If you have salt pork or bacon, you could use that instead to give the sauce a good flavor. 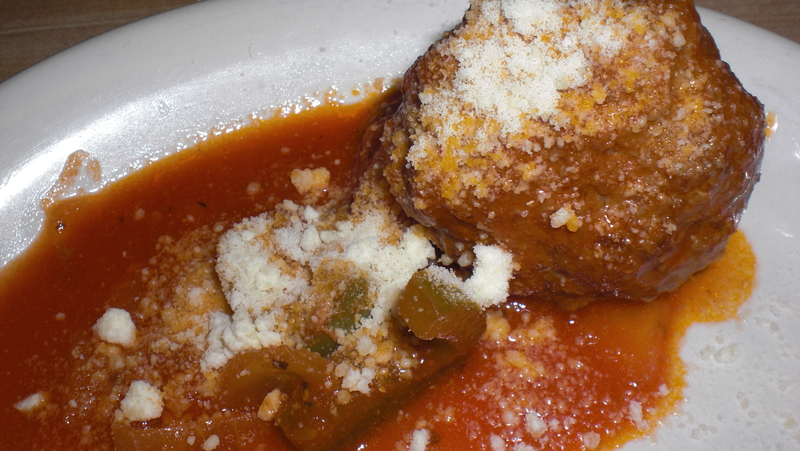 Remember, tomato sauce doesn’t need heat. Instead, it needs ingredients that will accentuate the sweetness of the tomato. Animal fats work well because the acidity of the tomato cuts into the richness of the fats thus balancing everything out, in quite an addictive fashion! Don’t forget the olive oil! I am thinking about seperating my product reviews and place them in another blog, which may take some time, but I will try to keep up with my cooking. There are several things that still haven’t made it on my blog yet, but it’s difficult to keep posting pictures everyday so I may post a few dishes in one post once a week. We finally did some grocery shopping and I’m very excited to finally have ingredients again to cook. I was getting tired of trying to make different pasta dishes with whatever weird stuff I could find. I have never purchased a whole chicken before, mostly because I thought they would be too expensive, but I found out that one chicken cost less than one little Cornish hen, and sure, the hen may have been healthier if it had been raised properly, but I doubt it. In fact, the two taste exactly the same when prepared this way. Canned or fresh cubed tomatoes. Chop the garlic and place it in a pan with a teaspoon of olive oil. Allow it to brown a bit. Add the onions and let them cook until transparent. Chop the bacon and add that as well. Keep stirring until the bacon cooks for a few minutes and add in the herbs. Take a third of the onion mix and stuff it inside the chicken. Place a couple of capers under the skin. Place the chicken in a big pot, dump in a large can of diced tomatoes, or chop up 4 tomatoes and add two cups of water. Add a teaspoon of salt and a couple of more pinches of rosemary and thyme as you see fit. Turn on the heat to medium and add a teaspoon of capers (or more, if you like) and half the jar of the capers’ vinegar. Wait for the sauce to begin to boil around the chicken and then turn it to low and cover. After an hour, flip the chicken around. You may want to baste the chicken with the sauce every 15 minutes to allow it to absorb the flavors. Let it slow cook for a few hours. The longer you cook it, the more tender and blended the flavors become. 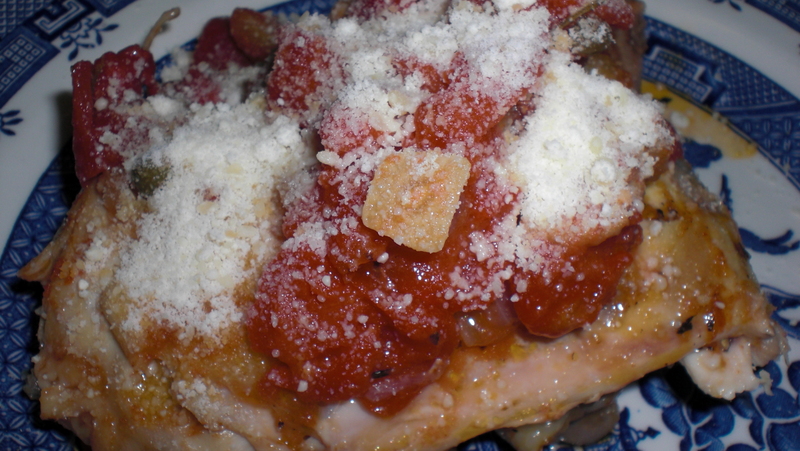 Place some of the chicken on a plate along with some of the tomatoes and sauce and sprinkle with Parmesan. Tip: You can always brown the chicken with your preferred method before slow cooking it. Remember that you can always place the left overs in a slow cooker or back in a pot to reheat. The best thing about slow cooking is that you don’t really need to pay much attention to it especially if you use a slow cooker! Just dig in when you’re hungry.